While capes in the 21st Century are limited to superheroes, in the 19th Century they were a common part of men's civilian clothing. This fashion translated to the military wear for officers when the war broke in 1861. Clothiers such as Tiffany and Co, and Brooks Brothers offered capes to their customers marching off to war. In August of 1861 the U.S. Army ordered 10,000 complete suits of French Chasseur [light infantry] uniforms. 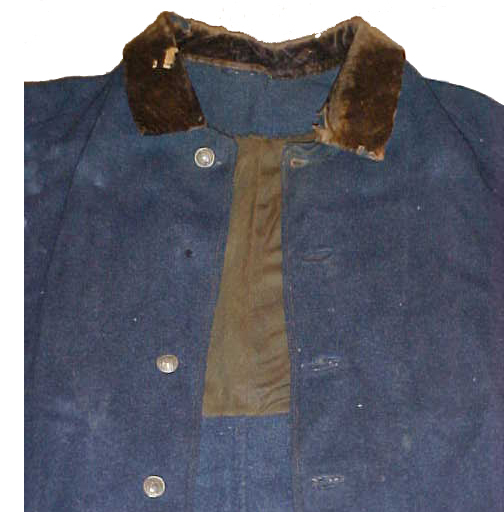 Originally intended to be the uniform of the entire Union Army, the Chasseur uniform would initially be issued to the division of General Fitz-John Porter. Competitions within the division were used to determine which regiments would receive the new uniform. The winning units were the 62nd PA, 83rd PA, 18th MA, 49th NY and 72nd NY. All of these units were issued the new uniforms. Part of the uniform included a hooded talma/cloak for the enlistedmen and a cape for the officers. The enlisted talma can be seen in Echoes of Glory. Recently a private collector in NY showed me a single breasted officer frock and cape that came from Porter's Division. Below are some of the details of that cape. ORIGINAL MATERIAL: The cape itself was made from blue-grey kersey. 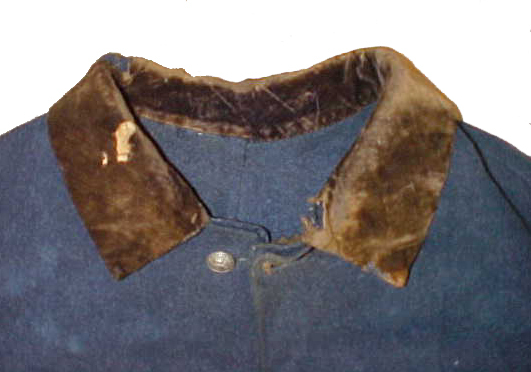 The collar was made from a black cotton velvet and was lined in the shoulders with a black silk. Both the collar and lining have now turned green/brown from age. REPRODUCTION MATERIAL: French kersey which compared favorably to swatch samples of English army cloth currently available from Family Heirloom Weavers. The silk will be woven to meet the original thread count and the collar will be cut from 100% cotton velvet. 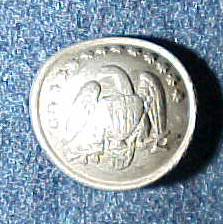 ORIGINAL BUTTONS: The original buttons are 1/2" French pewter buttons and have an eagle with thirteen starts in an arch at the top. REPRODUCTION BUTTONS: We are unable to find any suitable reproduction buttons to match the original so the reproductions will have cuff sized Eagle "I" buttons. PATTERN: The body of the cape has four panels and has a two piece collar. It is pieced in several places and is 38" down the center back seam and 30" along the front facing. We've drafted a pattern from the original cape and will reproduce the cape in one size that will work for our 21st Century body types. 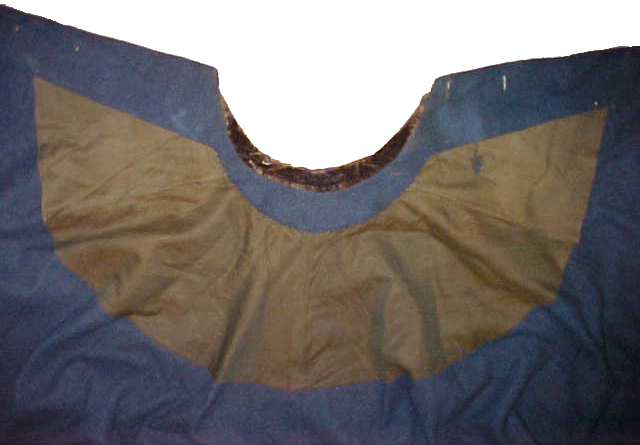 CONSTRUCTION: The cape was assembled with a mixture of machine and hand sewing. The topstitching down the front and the inside straight seams are done by machine, but the lining and collar are set in by hand. All the construction features of the reproduction will mimic the original garment. The thread count, types of stitches, thread color and even the size of thread will be an identical clone of the original. NOTE: The cape may be identified with some detective work. The cape and an officer's frock coat belonged to a Lieutenant in one of the four units mentioned above. There was a hook and eye on the left arm indicating that he had lost his arm at some point. His shoulder boards were black so he was probably on staff. If someone could check (hint, hint) the 49th and 72nd NY or the 83rd ot 72nd PA pension records for a one armed adjutant in these units, then it may clue us into his identity.